Literature has "died" many times--this book tells the story of its death by postcard. Picturing the Postcard looks to this unlikely source to shed light on our collective, modern-day obsession with new media. 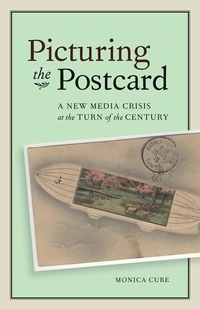 The postcard, almost unimaginably now, produced at the end of the nineteenth century the same anxieties and hopes that many people think are unique to twenty-first-century social media such as Facebook or Twitter. It promised a newly connected social world accessible to all and threatened the breakdown of authentic social relations and even of language. Arguing that "new media" is as much a discursive object as a material one, and that it is always in dialogue with the media that came before it, Monica Cure reconstructs the postcard's history through journals, legal documents, and sources from popular culture, analyzing the postcard's representation in fiction by well-known writers such as E. M. Forster and Edith Wharton and by more obscure writers like Anne Sedgwick and Herbert Flowerdew. Writers deployed uproar over the new medium of the postcard by Anglo-American cultural critics to mirror anxieties about the changing nature of the literary marketplace, which included the new role of women in public life, the appeal of celebrity and the loss of privacy, an increasing dependence on new technologies, and the rise of mass media. Literature kept open the postcard's possibilities and in the process reimagined what literature could be.